There is an increasing awareness on the importance in identifying early phases of the degenerative processes in knee osteoarthritis (OA), the crucial period of the disease when there might still be the possibility to initiate treatments preventing its progression. Early OA may show a diffuse and ill-defined involvement, but also originate in the cartilage surrounding a focal lesion, thus necessitating a separate assessment of these two entities. Early OA can be considered to include a maximal involvement of 50 % of the cartilage thickness based on the macroscopic ICRS classification, reflecting an OARSI grade 4. 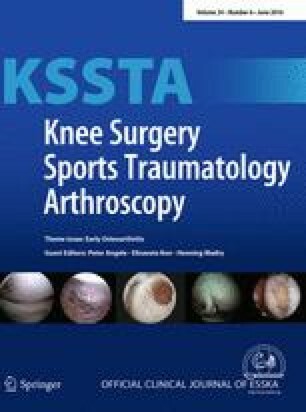 The purpose of this paper was to provide an updated review of the current status of the diagnosis and definition of early knee OA, including the clinical, radiographical, histological, MRI, and arthroscopic definitions and biomarkers. Based on current evidence, practical classification criteria are presented. As new insights and technologies become available, they will further evolve to better define and treat early knee OA.